When you make the choice to bring positive change to your life through cosmetic or plastic surgery, you want a doctor who inspires confidence the entire way. 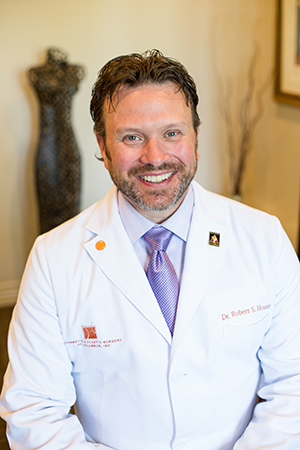 Dr. Robert Houser’s sincere warmth combined with his years of experience and formidable education will easily carry you along the emotional and physical journey surgery can sometimes be. When it’s done, you’ll know, just as he does, that he was born for this work. While it’s true that doctors tend to breed more doctors, few tend to stay within the same specialty as their parents. This was not the case for Dr. Houser: “I saw the joy that this work brought to my father and knew that was exactly what I wanted for my life, too.” As a native of Central Ohio, Dr. Houser made seamless transitions from undergrad at The Ohio State University, to medical school at Ohio University, and then back to OSU where he served as Chief Resident in his final year of their plastic surgery program. In 2003, his own chapter in the family’s history began when his cosmetic and plastic surgery practice opened. Since then, he’s won numerous awards for exceptional service and results, listed below. No one should ever obtain cosmetic or plastic surgery from a non-certified surgeon, which is why Dr. Houser has always been Board Certified by the American Board of Plastic Surgery (ABPS) and a Member of the American Society of Plastic Surgeons. Additionally, Dr. Houser is proud to be a Member of The American Society for Aesthetic Plastic Surgery—only about one-third of ABPS Board Certified plastic surgeons are elected to this prestigious organization. Schedule your consultation with Cosmetic & Plastic Surgery of Columbus and meet Dr. Houser by calling (614) 890-5565, or send us a question through our Contact Us page. We look forward to hearing your story and learning about the changes you want for your body and your life.